The pickup: Pomegranates, those leathery crimson orbs encasing a hive of jewels. They're seedy little treats, tart and juicy. Come winter, I'm grateful for the variety they offer when I'm beginning to tire of apples and pears and I've overdosed on citrus fruits. As a kid I loved packing a half-pomegranate in my lunch, a piece of exotica next to the salami sandwich and dill pickle. The results: Wrangling pomegranates is a messy (and clothing-staining) business; you can avoid stains by plunging pomegranate halves into a bowl of water and picking out the seeds under water. But I love seeding pomegranates over a plate; it means that, so long as I'm not sharing, I can lick my fingers as I go. If I'm not going to just eat the seeds as a snack, I'll toss them into a salad, or scatter them over couscous. And crushed pomegranates, of course, yield a delicious juice. Pomegranate cocktails, once unique, are almost ubiquitous now. This has more to do with the popularity and availability of pomegranate products — juice, molasses, etc. 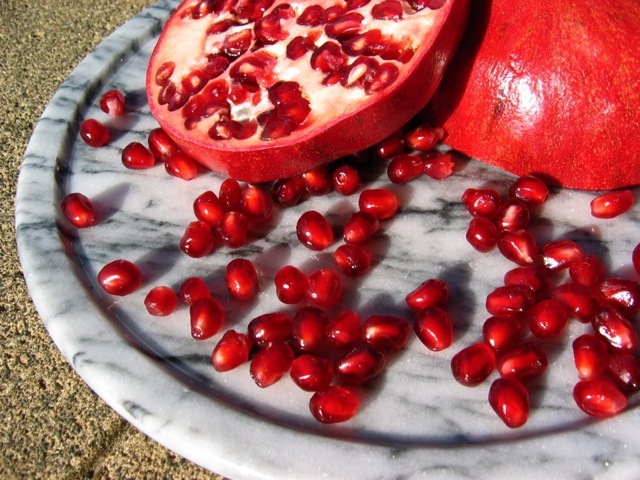 You can squeeze your own juice at home: Roll a whole pomegranate around on a countertop to break up the enclosed seeds. Cut the fruit in half, place a piece of cheesecloth over the cut side, and squeeze the juice into a measuring cup. For a delicious fresh cocktail, mix together the extracted pomegranate juice with the juice of an orange or tangerine, a tablespoon or two of agave nectar, and a shot of vodka. Pour this into a shaker with ice; shake, then empty into a martini glass.